A reinterpretation of the Extra Old cognac category. 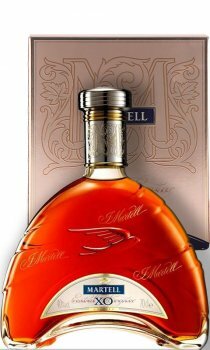 Its unique blend embodying the true essence and the creativity of the Martell style, and its luxury packaging and architectural design, make it the perfect expression for individuals seeking to build and leave a mark in history, to create their own sophisticated and inspired world. Taste: a soft and silky feeling releasing the mellowness of this first instance and reinforcing the smoothness of the sophisticated blending. This initial mellowness is then intensified by an incredible length in mouth, bringing the flavours into full bloom. Rare, exclusive and reserved for connoisseurs are just a few of the many adjectives preceding Martell Extra's brand history which was created at the beginning of the 19th century. Today, Martell Extra reveals itself under the signature Martell Creation Grand Extra, as a testimony to the creative spirit of Jean Martell. Martell Cellar Master, Bruno Lemoine, perpetuates Martell creativity with the superb blending of Martell Creation Grand Extra. Sophisticated yet straightforward, it is a true reflection of the asserted personality drawn by eaux-de-vie carefully selected in our Creation Cellar. Martell Creation also pays tribute to the bottle designer, Serge Mansau, who was instrumental in bringing the triple-arch shaped design with architectural inspiration. Resolutely contemporary, this decanter is a fusion of harmonious, pure lines and richly-crafted decoration, the natural expression of Martell's heritage and creativity.